[prMac.com] Brentwood, Tennessee - Conchware today is proud to announce the release of Bumble Bom Bee 0.0.515, a maintenance update to their popular game title for iOS and Android devices. Welcome to the future of match gaming. Bumble Bom Bee, the world's first physics-based tile matching game is one of the most challenging and intuitively fascinating puzzle games to be introduced in recent times. By taking the basic gaming principle of swipe-to-match we have moved into a new realm of possibility in which mechanics that consistently generate results in the inherently unpredictable world of physics and mathematics are now a reality. Through extensive study of geometry and bees we have discovered a way to spontaneously generate order out of the inherently random movements of multiple objects, allowing for gameplay experiences which have never been possible or seen before now. The dynamics and flexibility of such a system allows for a player to do anything they please and although you might not know where the tiles are going, when they stop you are always presented with a perfect honeycomb. "From the beginning Bumble Bom Bee represented a single desire: to take the original idea conceptualized by Eugene Alemzhin when he designed Shariki back in 1994 and improve on the fundamental core concept which made it so popular using modern technology. We have carefully studied the industry that has grown from this origin in the 23 years since, making note of the features considered most desirable so that they can be readily reintroduce to the player in this new environment so that the player will recognize never feel like they left anything behind when they pick up Bumble Bom Bee for the first time." elaborates J.M. Leonhard, the man behind the invention. "Gamers the world over will find many features of Bumble Bom Bee familiar and will pick up the game feeling as if they have played it before. This is very much intentional in our attention to detail. Just like how a smell in the wind can bring happy memories, a game should be as much about what you are doing as remembering who you are. The player deserves nothing less that the dignity of a game which strives to offer them muster and Conchware, through Bumble Bom Bee, seeks to provide the best physics based tile matching experience possible." In addition to everything mentioned so far Bumble Bom Bee also makes extensive use of multiple game modes, obstacles and objective that combine into many different combinations of levels and of a specially designed A.I. created to help the player throughout their game play experience. This A.I. does everything from show the player how different obstacles work in the tutorials, teaching beginner players how to play the game without the limitations of language barriers, to offering valuable hints and suggestions when the player cannot find a move and automatically shuffling the board if no moves are possible. As a result Bumble Bom Bee is a game that, while instantly familiar to millions, is unlike any other game on earth. 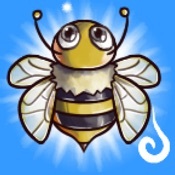 Bumble Bom Bee 0.0.515 is currently available for Free at iTunes App Store in Games category. Bumble Bom Bee is also available in Android for Free at Google Play Store in Casual category. Bumble Bom Bee is a product of Conchware, founded by J.M. Leonhard. After graduating from college he began his study and research in the foundations of early AI game theory and logic programming in an attempt to create a crude central pattern generator, which evolved into multiple innovative mechanics. Research continues. Bumble Bom Bee is the first result of that effort. All Material and Software (C) Copyright 2017 Conchware. All Rights Reserved. Apple, the Apple logo, iPhone, iPod and iPad are registered trademarks of Apple Inc. in the U.S. and/or other countries. Other trademarks and registered trademarks may be the property of their respective owners.